Family & friends are invited to attend Visiting Hours on Tuesday, August 28th in the Vertuccio & Smith, Home for Funerals, 773 Broadway (Route 107) REVERE from 4:00 p.m. to 8:00 p.m., for Rosina (Annicchiarico) Imbriano, who passed following a long illness at her East Boston residence on Saturday, August 25th. Her funeral will be conducted from the funeral home on Wednesday, August 29th at 10:00 a.m. & followed by a Funeral Mass in the Church of the Sacred Heart, 45 Brooks St., East Boston at 11:00 a.m. and immediately followed by interment at Holy Cross Cemetery, Malden. Born & raised in Grottaminarda, Naples, Italy, the family immigrated to Argentina, South America in 1950, where they remained until moving to the U.S. & settling in East Boston in 1960. Her life-long occupation, was the welfare and nurturing of her family, especially her five sons & their families. 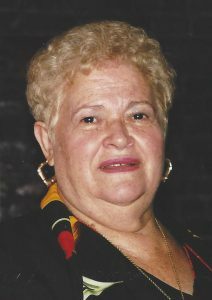 She is the cherished mother of Antonio & his wife, Ursula Imbriano of Malden, Alessandro Imbriano, Felix Imbriano & his wife, Angela all of East Boston, Michele Imbriano & his wife, Rita of Lynn & the late Mario Imbriano. Rosina was also the beloved wife of the late Felice Imbriano & the devoted daughter of the late Alessandro & Palmira (Capuccio) Annicchiarico. She is the dear sister of Anna Carpinito of East Boston & the late Michele Annicchiarico. She is the very proud grandmother of Ursula Bulla & her husband, Joseph of Malden, Anthony Imbriano & his wife, Jennifer of Peabody, Alessandro Imbriano & his wife Kelley of Peabody, Michael Imbriano of Revere, Felicia Imbriano of East Boston & Giuliana Imbriano & Gemma Imbriano, both of Lynn. She is also lovingly survived by many nephews, nieces, grand-nieces & grand-nephews in the USA, Argentina & Italy. Rosina is also proudly survived by her faithful care giver for the past nine years, Lena Machiavelli of East Boston. Tuesday, August 28th from 4:00 p.m. to 8:00 p.m. In lieu of flowers, remembrances may made to the American Cancer Society, 30 Speen St., Framingham, MA 01701.